I didn't know how little I knew this plain little bird. Every year I watch for the Pine Siskins, and almost every year, late in the migration or early in the winter I see one or two, or even a few. But that's not enough to learn a bird. I didn't know their flight call, I didn't know their song, I didn't even know how much they vary. Here are some that dropped by in November of 2005. The ones around now have been too flighty for me to get an identifiable shot. We've had a flock of thirty or more in the yard, at the feeders, every day for a couple of weeks now. So now I know: While many are drab, some have a surprising amount of yellow hidden under their wings and in their tails. I know their call, and I've even heard some singing. 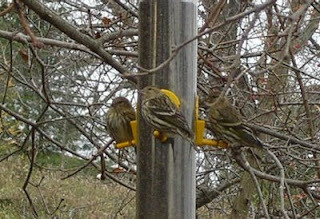 Now I finally know the Pine Siskin! This winter I have definitely seen more siskins than at any other time. Pamela, I didn't know you were back to the blog. Great to read about your ambulatory exploits again. I hope to see you back on the blog soon. the last time I visited you hadn't blogged in awhile, so I'm delighted to read a current post Pamela. We haven't seen many irruptive species this past winter, so it's a treat to view your photos. I came to your blog via a search on a particular butterfly in my Niagara Falls garden. Just thought I would say hello from a US neighbor south of you. Treks Himalaya an indoor outdoor trekking and tours operative company takes you that further way to guarantee you has an unforgettable adventure Trekking in Nepal that you have been dream with Treks Himalaya is part of your choice. We have your choose of trekking for 3 days or 30 or more days it depending of your timetable, sleep under lodges or tent. We always respect our duty to constantly your holiday satisfaction in Nepal. Natures renew to Treks Himalaya one’s own self regard, to relive oneself, to realize Nepal beauty, to interact with its generous, friendly peoples are highlights of Trekking in Himalaya. Whether you are looking for a quiet gateway, a memorable Hiking in Nepal outing with a family or an exciting nature adventure. We offer you with the best progressive information and itinerary leading focused and modified as per your requirements. It is significant to memorize, though, it necessitate an enough level of physical homework and must remembers that there is also a psychosomatic assurance in walking in mountains. Acute trek is an attempt to encourage Nepal to the exterior world while striving to defend an aged tradition as well as conserve the surroundings for generation to come. Treks Himalaya specialize in organize Nepal travel activities excursion such as:- Nepal trekking, Helicopter tour, peak climbing, mountain flight, Honeymoon Tour, sightseeing tour, jungle safari, rafting, Pilgrim's Tour, Hotel booking, Air ticket, Tibet Tour, Bhutan Tour, Paragliding, Bungee Jump, Eco Tour, local village tour and many more.